1. (U) PURPOSE: To provide situational awareness to Minnesota National Guard (MNNG) personnel with respect to travel to the United Mexican States (Mexico). b. 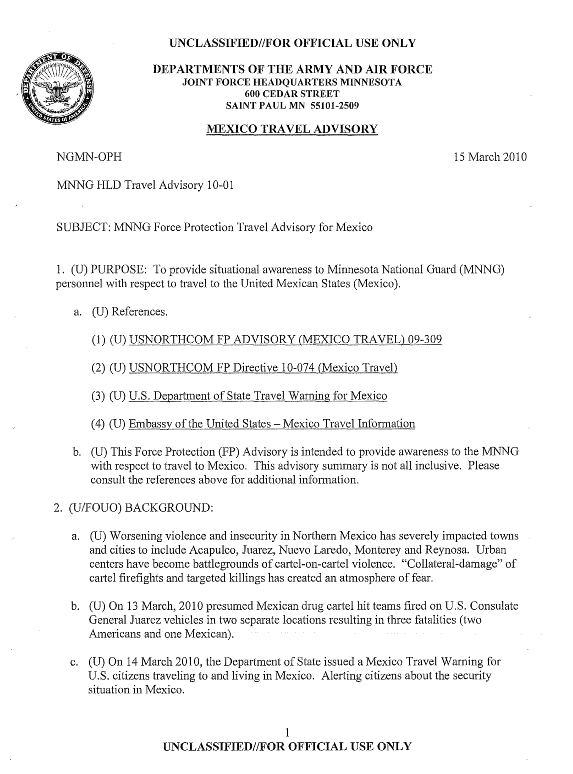 (U) This Force Protection (FP) Advisory is intended to provide awareness to the MNNG with respect to travel to Mexico. This advisory summary is not all nclusive. Please consult the references above for additional information. cartel firefights and targeted killings has created an atmosphere of fear. kidnapping or other crimes should notify Mexican law enforcement officials and the U.S.
efforts as a threat, potentially targeting DoD persOlmel. March, 2010 and Mexico Country Specific Information.